Assistance League Sites > Assistance League - Victor Valley > News > National Operation School Bell® Award. National Operation School Bell® Award. 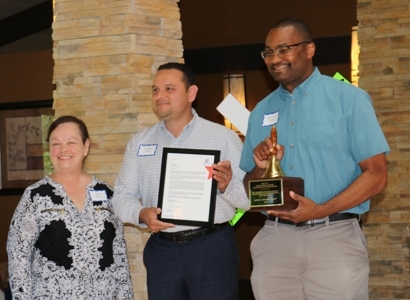 On May 14, 2018, Mr. Donald Greene, Manager at Fallas in Victorville, CA, was presented with the National Operation School Bell award. The award was presented at the 2018 Assistance League of Victor Valley’s installation luncheon. Also attending was Ralph Avila, District Manager from Fallas. Mr. Greene also received a congratulatory letter from National President, Susan Dolen. Mr. Greene received the award for his outstanding support for the Operation School Bell program. He is at every event and goes out of his way to supply needed uniforms and school clothes for our low income students in the High Desert. Photo includes Penny Weiss, OSB Chariman, Ralph Avila, District Manager and Donald Greene, Manager. 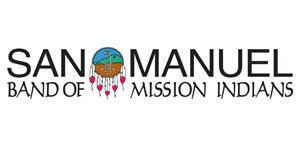 San Manuel Band of Mission Indians Make Donation for Operation School Bell.